A dive bar was once a seedy watering hole of ill repute. But these days it’s more likely to refer to a cool, unpretentious, affordable venue, with cheap beers, no frills and a neighbourhood ambience. 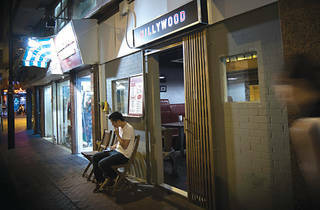 And Hong Kong is no stranger to these bars, be it a local Canto darts-and-dice haven or a sultry whisky spot. But there’s a distinct lack of venues that set out to be ‘contemporary dive’, a bar designed for residents of an area – of any background – to enjoy good quality tipples at affordable prices in simple surrounds. 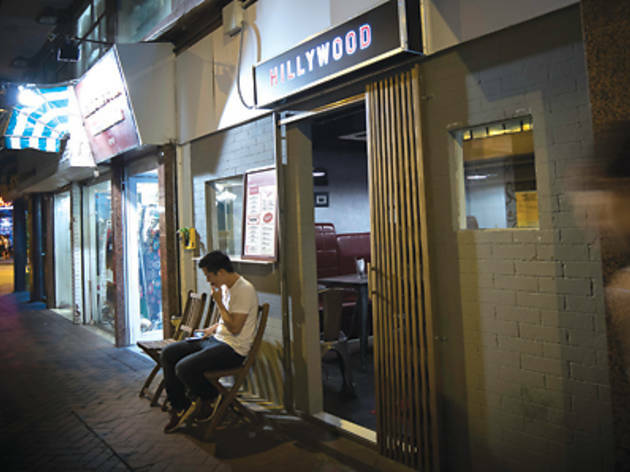 The new Hillywood though, tucked away in TST, aims to do just that. This is a neighbourhood haunt where you'll manage to avoid both queues to get in and the oh-so-common extortionate bill at the end. Run by three self-proclaimed hipsters, Hillywood is anything but commercial. The interiors are modest and mismatched, with exposed piping, patchwork floral wallpaper and a random selection of posters. In line with this, the menu is also somewhat askew, with drinks ranging from signature white cocktails, all featuring milk as a main ingredient, to some great draught beers and the quintessentially English Pimms cup ($88). We opt for the latter, which is fairly unremarkable. It’s just the usual Pimms-and-lemonade combination with some chopped fruit, cucumber and mint floating in it. The horchata ($98) fares better, though. A generous cinnamon sprinkling, as well as a whole cinnamon stick, gives this milky concoction a distinct sweet aromatic flavour which combines well with the warming rum and mellow milk tones. We also order a side of fries ($58). Piping hot and served with an unexpected truffle mayo, these are a welcome accompaniment that elevates the simple chip. Hillywood 46-48 Hillwood Rd, Jordan, 2736 9906; facebook.com/hillywoodhk.